Recently i have had the urge to get a tattoo but deciding to get a tattoo is just as hard as picking a university. It seems that placement is the hard part for me. Even then i want the best tattoo artist to actually do my tattoo as this will be on my skin for life but then if i get what i'm thinking of getting its not to complex. It seems like such a long process of thought and effort just to get a tattoo. 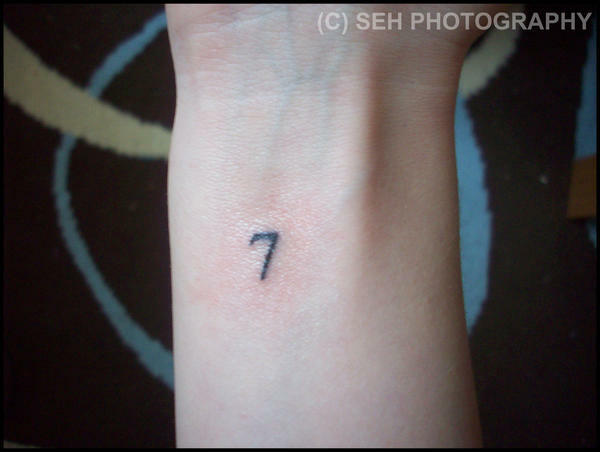 I know what i would get... i think i want a number 7 tattooed on me. The tattoos i've looked at either numerical forms like David Beckham's on his arm which is where i'm thinking of having it. I dont really like that thought so i'm thinking of having it more like this. Although i would want it a bit bigger. If i do go ahead with getting a tattoo i have to discuss it with my mother... wish me luck. She hates tattoos. Especially in places were there always going to be visible or i could just get it and get shouted at. i do think its important to think about having tattoos and discussing them with loved ones as inking your skin is for life, not just a week or two and then washes off in the shower. Childhood tattoos.